Question: Who is the only man to portray Michael Myers in consecutive movies? Answer: Tyler Mane (Halloween, Halloween II). Tyler also played Sabretooth in the megahit X-Men (and was in an often forgotten/under appreciated film How to Make a Monster). He’s the former WCW wrestler (as I remember him) Big Sky, and he’s making a transition from silent antagonist to good(ish) guy in the upcoming film Penance Lane. Crimson Matthews is trying to make a new life in Chesterton (A ghost town since the local mine shut down). Fresh off another stint in jail, Crimson takes a job as a handyman at the old, dilapidated property on Penance Lane. Within the walls of Penance Lane he unleashes a world of dark secrets and violent intent. With the threat of being dragged into its hellish depths, will Crimson finally learn when to walk away? Or will he drag the town of Chesterton into this nightmare prison greater than anything he’s ever known or even imagined? 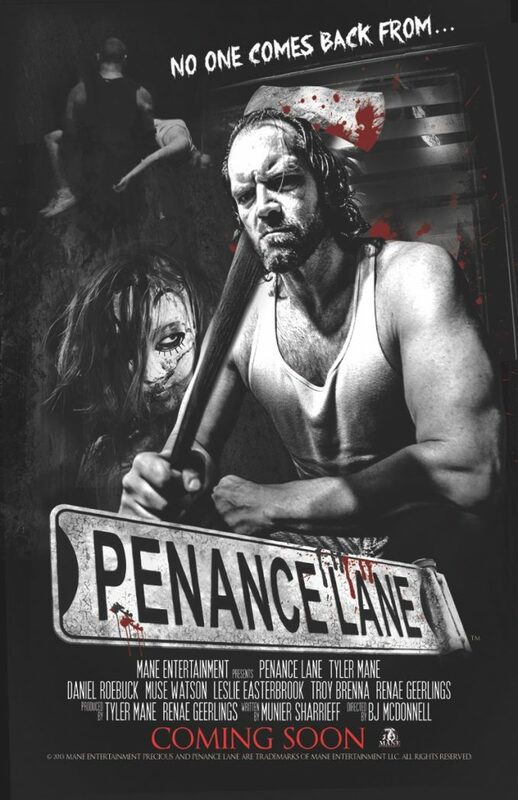 Penance Lane is currently crowd funding through Indiegogo (ending December 24, 2013 if anybody’s looking for last minute ideas). There are some truly horrifying images there, and I am getting pumped for this movie. What is that creepy girl coming up from underneath the bed? Who is behind the blinds? What secrets does this house hold? Director BJ McDonnell (Hatchet III) takes the reigns here behind the camera. Inspired by his grandfather Leif Erickson, McDonnell moved from Florida to California. Once there, he received his degree in cinema and appeared in over 130 films/shows as a grip, camera operator, or steadicam operator. In 2013, McDonnell made his directorial debut in Hatchet III (with Danielle Harris and Kane Hodder). More Trivia: What’s the greatest horror movie rock video ever? If you aren’t excited yet, George Lynch, the former lead guitarist of Dokken, is writing the soundtrack of the to Penance Lane along with White Lion/Megadeath bassist James Lomenzo. Lynch is considered by many to be one of the top guitarists of all time. The Indiegogo perks are pretty good as well. They range from access to a special production diary ($) to an IMDB entry walk on roll (where you are killed on screen) ($$$$) before you start getting into the producer money territory. Anything between $25-$60 is very appealing to me.